So, you say you're a rapper but you're broke. Sure you'd like to start building up some street cred, but it's hard to sell that fire mix-tape when your boys are calling you names like: No Chains, 50 Cents, and The Notorious IOU. Well, maybe it's time you put an end to these shots they keep taking at you by grabbing some bling! Yes, we realize that gold chains iced with some diamonds can be pretty expensive and as we've already went over, you're broke. No worries, we have the solution. 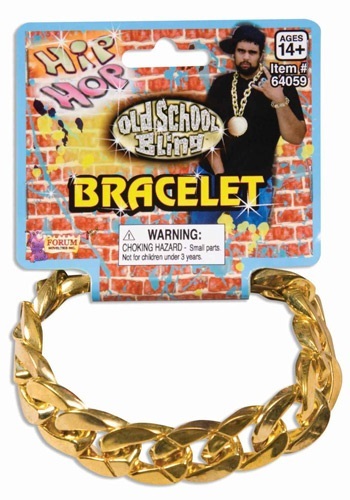 Try wearing this Gold Chain Link Bracelet. Once your crew sees you sporting this bling they'll think you finally got a record deal. They'll stop knocking you and finally start supporting your endeavors to be a world famous MC. So rather than waiting to dress like a success, start now and get in the mind set that the greats had while spitting their bars in the booth when you wear this golden bracelet.